As a little girl, my mom would bring me along to furniture stores and I hated it. I would cry because, from the perception of time coming from a child, it seemed like we spent hours in there. And since there were no toys, there was nothing remotely interesting to me. It was the most boring thing ever. I think now that I'm a big & strong adult, I have a greater appreciation for interior design. In fact, it's amazing how much I've changed, because I even would go as far as saying that I have a fascination with interior design. And the more I'm exposed to it, the more I begin to understand it. I can now appreciate why my mother needed to spend hours (20 minutes) in a shop. I have begun to realize that interior design has trends that come and go and are recycled nearly as much as they are in fashion. These days, I'm seeing many familiar elements in home pieces, perhaps lightly influenced by the return of the 70's era. So yeah, this week we'll talk about some funky 70's decor. But before I dive too deep into my analysis of the lava lamp or bring out my special mention to the sunken living room, I'll indulge a little in the architecture. The organic architecture of Frank Lloyd Wright and the modern designs of Ludwig Mies van der Rohe and Frank Gehry were quite dominant as influencers in this decade. Architects dabbled with the geometric and unconventional designs, often misconstructing the standard shape of a building. They began to experiment with materials like steel, glass, solar panels, and wood and modelled their work with elements of pop-art and modern art in mind. 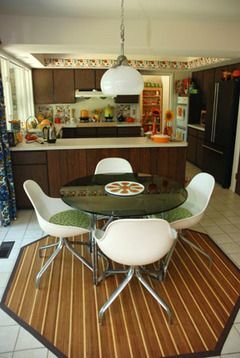 Significant colour choices were made in this decade, opting for natural, earthy tones (rich browns and greens and muted yellows and oranges) over the bright and bold colours of the 60s. And as the tendency is to stray away from the decade before, by the last few years of the 1970's, postmodernism became apparent in architectural style. The 70's were a very organic time. A big part of society rejected the ideas of materialism and consumerism and returned to their natural roots and holistic beliefs. Houses were built with wood panels, massive windows and skylights, stone fireplaces, and often were decorated with a multitude of plants (sound familiar, cactus lovers?). The "hippie" lifestyle encouraged crafts and decorated the house with macramé, string art, crochet and embroidery work. This brings me back to the earth toned colours I mentioned earlier. Perhaps congruent with the economic downfall at the time, the dull-toned colours were at times considered drab. However, in spite of this, colour was very much present. Very much. On everything. Like somebody just vomited orange all over the bathroom. I think every single toilet we see today is porcelain white, but back then, it was pretty standard to have an orange toilet seat cover. But colour is something wonderful, if you ask me. It was around this time that a critical shift in the arrangement of the home became evident. Rooms became more family oriented and had more of an open concept behind them. They broke free from the idea of being a four-wall environment to serve a single purpose. For example, the kitchen is primarily used as a place for cooking, but by expanding the kitchen and placing in it a bar or island, it no longer is solely a place to cook, but can also invite people to sit and eat or chat or read. Instead of there being an obvious divide between the common rooms, walls were taken away and the kitchen opened up to the dining room, which opened up to the living room. The style of the house was structured in a more open environment, often being a single level, with higher ceilings, big windows and access to a yard. Kind of like a ranch. Furniture-wise, colours and patterns were prominent. Chairs were bulky and rather masculine. They abandoned the idea of being there only for function and became the most captivating article in a room. Iconic chairs like Arne Jacobsen's Swan or Eero Saarinen's Tulip chair were celebrated. Shag carpets, teak wood, moulded plastic furniture, golden embellishments, lava lamps, textured walls, terracotta tiles, wicker furniture, plants galore, geometric pieces - all were brought to life in a 1970's household. Taking us back to today, it's interesting to find some correlations between 1970 and 2017. Terracotta tiling is making a comeback and jewel toned furniture pieces and golden accents are becoming more and more popular. People are taking responsibility of not only one plant, but maybe ten (how????? please tell me). Patterns and textured pieces are increasingly being sold and according to pretty much everybody, green is going to be huge. I find it exciting to look at a retro picture of a living room and pick out what I like and don't like. I'm developing my own personal taste for interior design and I think, very much like the 70's era, my taste is eclectic. But I guess that's what personal expression is all about.